There’s a lot of people who worry about me, or a lot of people who serve as a security blanket. Either way, it’s nice to know that my daughter and I are on the front of some people’s minds. Seeking the help to power through another match. It’s not too much to ask, really, that I act as a single dad for the better part of a week while Mrs. So This is Fatherhood gallivants around New York with her family. It’s exhausting, sure, not having someone to tag into the ring with you. Hell, even Hulk Hogan had Brutus Beefcake as a tag team partner, but he did some of his best work solo. Therefore, my daughter in this case would be Andre the Giant – no matter what you tried to do to slow her down, she just kept chugging along. 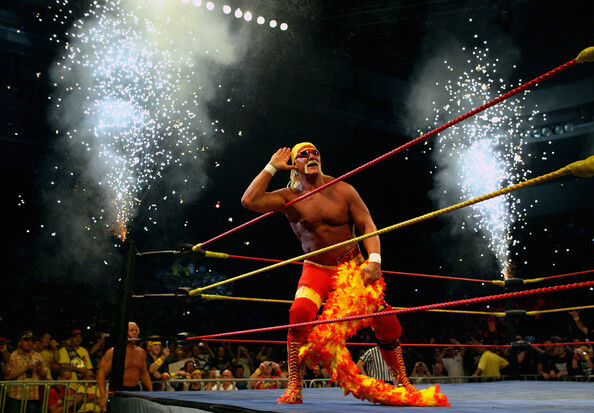 Here I was, the Hulkster, using my crowd of friends and family checking on me, to keep me going. If only I had waved my hand to my ear to hear them better and summon up the strength. The hardest part is knowing that you might be defeated … and yet, you keep moving ahead because the championship belt is in sight. My championship belt, in this case, was a very strong drink around 8:30 every night when she was asleep. The kid is just over a year old. She is a whirlwind, leaving toys and various household items in her wake. Andre the Giant didn’t do anything gently (except maybe rhyme a little at the beginning of The Princess Bride) and neither does my daughter. So, yeah, it’s a little crazy keeping up with her. When you do win a round and she’s taking a nap, then you really need that Hulk Hogan theme song to keep you going. That’s when you’re the Real American Hero and do all the yard work, or laundry, or clean the house, or whatever chore is next in line, and you power through. You are spent when the day closes, but it’s the type of accomplished feeling that only comes every once in awhile, like when you take down a 72 oz. steak and get a free T-shirt. Victory. unfortunately we couldn’t match these outfits. 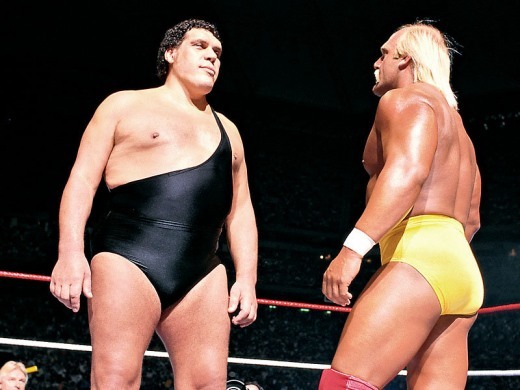 Andre the Giant had a weakness and it was ultimately his size that did him in. Same with my daughter. It’s her initial miniature status of a human that catches you off guard as you constantly are bending down to play defense, battling on her terms. Yet, when you figure out how to use that size to your advantage, then you know what to do. Her size creates her downfall. There is only so much energy in that body of hers. I just had to wait for my opportunity and pounce. It’s exactly what Hulk Hogan did in Wrestlemania III. He won and I won. But it will be nice when my Brutus Beefcake returns to slap my hand and leap over the ropes, into the ring. Love the comparisons between wrestling and parenting, really enjoyed reading this. Thanks Jonathan! It’s definitely a round-by-round experience every day!